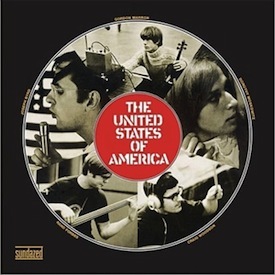 The United States of America album is the product of Joseph Byrd, former FLUXUS member, artist and UCLA instructor who managed to combine experimental art and early synthesizer technology with psychedelic rock. Employing percussion instruments, electric violin and acoustic strings, electric bass, various keyboards, homemade oscillators and ring modulators (with Dorothy Moskowitz’s confident soprano) this record shows surprising pop capability for an avant garde project. United States of America is a pioneering record that is worth your attention. Everyone wouldn’t be expected to sit through campy synth exercises like “I Wouldn’t Leave My Wooden Wife For You, Sugar,” but many tracks hold up as strong experimental rock numbers. It’s a must listen for fans of ear candy, or those who love delving into the details. Tracks like the opener, “The American Metaphysical Circus,” feature layers of burbly oscillators, organ, calliope, and sound effects or field recordings. Other tunes tear it apart pretty hard for a guitar-less album like “Hard Coming Love” and some more restrained numbers make great careful listening material like the excellent “Cloud Song.” Dorothy’s vocals are very strong and lead with unexpectedly memorable lines. The melodies and flow of the record, the sampled recurring themes, and the politically charged lyrics give this album a concept record feel. It was critically acclaimed on its release in 1968 but failed to sell, of course. The band broke up after their masterful debut though Byrd would continue to create experimental music and Moskowitz would eventually sing with Country Joe McDonald. Always wondered what this one sounded like. Intriguing…and for fans of Broadcast (RIP) no doubt! Could never understand why this band weren’t huge with the psyche-deeelic crow back in the day. Great album. Standout tracks – for me – were “Wouldn’t Leave My Wooden Wife For You Sugar”, “Love Song for Che”, “Coming Down” and the mighty “Hard Coming Love”…ah, those were the daze. I’m with Lynchie on those tracks. I loved the whole thing (and had it, complete with the manilla envelope). In a time when Zappa and Beefheart were defining the outside edge, The US of A were welcome compatriots on a slightly different edge, I enjoyed their sense of humor almost as much as Frank’s & Don’s. Follwed Joseph Byrd through his next project with “The Field Hippies” but lost him after Columbias dropped him.